The St. Petersburg/Clearwater area is a wonderful place to live and vacation. With a variety of outdoor activities, it’s not uncommon for injury to occur on the water, in addition to routine accidents that can occur in the course of every day life. At Link & Smith, P.C. our personal injury attorneys help clients who have been injured in accidents get the compensation they deserve for their injuries. Whether you’ve been injured in an automobile accident, boating or jet ski accident, or other type of accident, we are here to help you. There are certainly no shortage of personal injury lawyers available for hire, so why should you choose us? We believe that our case results (including six-, seven-, and even eight-figure settlements) speak for themselves. In addition, we work on a contingency basis, meaning that you only pay for our services if we are able to win your case. As a small law firm focused exclusively on personal injury law, we have the skills, experience, expertise, and focus to fight for you, and do everything we need to do to get the results you deserve. You are more than just a case number at our law firm; you are a real person, and will be able to work personally with our esteemed lawyers, Mark Link and Houston Smith. If you’ve been injured, please contact us today! 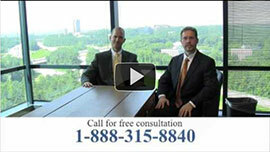 We will fight for you in order to get the settlement you deserve.